The European currency continues to decline against the American dollar within a wide downward channel. For two weeks, the euro has been growing amid a decline in demand for the dollar. An additional factor in the depreciation of USD were negative releases on orders for durable goods, indices, factory orders, and the US labor market. The data on the US GDP in 4Q2018 turned out to be better than the consensus forecast but had practically no effect on the rate of USD. Now the pair is consolidating and determining the trend vector. Today's data is unlikely to significantly affect the dynamics of the instrument. In the medium term, there is a high probability of a decline and the pair falling from current levels to 1.1250, 1.1235 (local minimum of mid-February) and further to 1.1200, 1.1170. An alternative scenario will be the breakdown of key resistance levels and the upper border of the range at 1.1400, 1.1430. 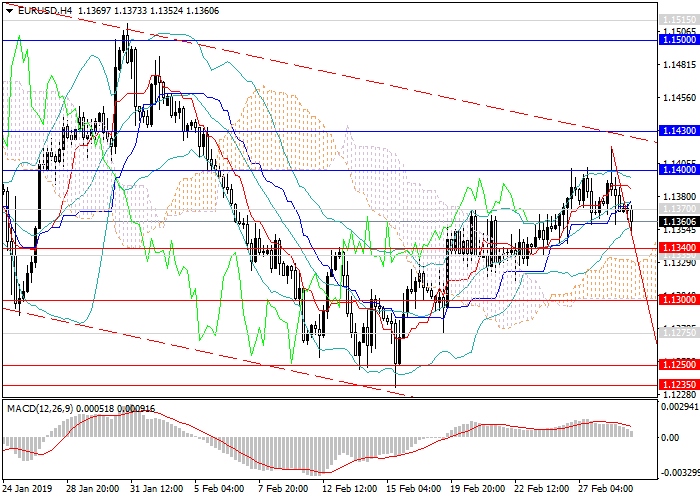 In this case, the pair will change the direction and will tend to the levels of 1.1500, 1.1550, 1.1575. Technical indicators on W1 chart and above keep the decline signal: MACD indicates the preservation of the high volume of short positions, and Bollinger Bands are pointing down. However, on H4 and D1 charts, the indicators change the descending signal to the lateral or upwards. Support levels: 1.3270, 1.3200, 1.3160, 1.3100, 1.3030, 1.3000. Resistance levels: 1.3300, 1.3350, 1.3410, 1.3450, 1.3500, 1.3550. Short positions may be opened from the current level with targets at 1.1250, 1.1235 and stop loss at 1.1460.